This trail takes you past the beautiful springs of the Biscuit Basin on the way to the wonderful Mystic Falls. The trail begins by crossing over the Firehole River. You walk across the boardwalk, visiting the many crystal clear pools in the basin, like the incredible Sapphire Spring. As the boardwalk approaches the forest along the hillside, the trail for Mystic Falls leaves the boardwalk and enters into the trees. 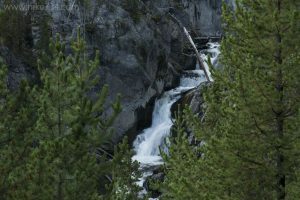 The level path continues through the trees with limited views until it comes alongside the Little Firehole River. This playful river keeps you company with the occasional steam vent or colored patch of algae until you can hear the falls. You enter the amphitheater where Mystic Falls cascades 70ft/21m over large boulders. Follow the trail up higher for even better views of the falls. Turn around and head back, or continue on the trail that loops to a wonderful overlook with panoramic views of Biscuit Basin. This option climbs 400ft/120m and adds 1.7mi/2.7km to your hike. Trailhead: Turn into the signed parking lot for Biscuit Basin on the west side of Grand Loop Road, just north of Old Faithful.